Spot the changes. This was about 1960. In his address as chairman, John Bloomfield reviewed some of the many activities of the Society and confirmed its aims which, thanks to the new Files Group, could now be found on the world-wide 'Internet'. With the consent of those members present he was planning to write to the Department of the Environment on our behalf, concerning the recent introduction of 'en bloc' legislation affecting the Hadleigh Riverside Walk and Broomhill Local Nature Reserve. The contents of the proposed letter were read out and approved with one dissension, relating to the lack of cover for the flying of hot air balloons! John also proposed a donation of £50 to the Hadleigh Guildhall Garden Fund for the grand opening, which was seconded by Graham Panton and carried unanimously. During the year there had been 7 open meetings and numerous group meetings, in private homes and the Archives room of the Guildhall complex. The Society continues to grow and all concerned were to be congratulated for their efforts. Particular thanks were due this year to Hattie Bawden for her liaison work with the Suffolk Preservation Society, the Hadleigh Show and the Guildhall Garden project and for heading the Society's Planning Panel. Graham Panton and Martin Freeth were also singled out for their work in re-designing the Newsletter, (which continues to be brilliantly edited by Jim Betteridge - some say), and for putting the Society on the world-wide 'Internet'. This year Dennis Partridge was standing down as Hon. Treasurer, under the 5 year rule, and was thanked most sincerely. Also standing down with our grateful thanks, were Nora Betteridge and Hazel Wood who had provided refreshments at our meetings for the last 11 years. Presentations were made to each. overhead surveillance. either by conventional aircraft, or by miniature types with CCTVs (Closed Circuit Television), are banned: but not balloons. which is suggestively curious. This site is equally out of bounds if approached by water. Sub aqua explorers, whether employing the primitive Snorkel, or the professional's sophisticated SCUBA are likewise banned: as also are model yachts; might they not tow a hooked trawl, or carry secret sonar equipment? While memories of school days' history remind us that it was a flock of geese that warned the defenders of ancient Rome that attackers were creeping upon them under cover of darkness: indeed all wild birds have their alarm calls and therefore are to be protected. There must be some secret manufactory proceeding on the adjacent small industrial estate: the question is what could it be, who is behind it, and why here? Two very profitable sidelines come to mind. and the first is a Suffolk Whisky distillery. In the 18th C. Hadleigh had a roaring trade in smuggled spirits and without doubt the descendants of some of the families thus engaged are still resident among us: the financial incentives to trade up are considerable. Then there are the local advantages of large and reliable supplies of barley from our farmers. A well screened but accessible site amidst other diverting activities, abundant clean water for mixing the mash and cooling the still and, above all else, an adjacent deep hole in the river in which to store the precious liquid in plastic sausages. The sole objection to this suggestion, yet a serious one, is that the process has a strong and distinguishing smell, and this, the only possible location, is to windward of the homes of many law abiding citizens who, at this time of the year, will be sleeping with their bedroom window open. Therefore we must fall back upon the second possibility. Colombia, that S. American country, a land of jungles and rivers, with impoverished peasants cultivating the Coca bush upon allotment sized plots on the higher ground, has several suggestive parallels with Hadleigh. There the whole community, government, army and air force (they don't seem to have a navy) appears to be at one with enterprising cartels in producing a product for which there is virtually a world-wide demand, with the promise of riches beyond the dream of Premier Division footballers. Hadleigh has enterprising industrial chemists to whom an alternative product could be a most profitable sideline: our numerous allotments, with their skilled cultivators, are close at hand. The up draught of heat from the process would divert spotter balloons, so there is no need to ban them, and a site at the bottom of Pound Lane would have the other advantages already mentioned. The real difficulty for such an activity comes from uncertainty about the response of adjacent local government: they are about to forbid many things, but not this! Have they not thought of it? Or is the sudden proposal to impose these restrictive bylaws an indication that all of them, ejected members and their staff are in it up to their elbow, and in deadly fear lest some inquisitive new comer "blows the gaff "? The purpose of the Plan is to clearly identify the priorities for policing Suffolk for the year and to declare the targets by which the performance of the Force will be measured. The plan identifies 8 objectives, placed in order of priority according to the results of the various methods of consultation employed by the Authority. In addition to the objectives the Authority believes it is essential to declare standards of service by which the objectives will be achieved. This has been done by identifying key areas where the quality of service delivery is so important. The Constabulary will be measuring performance against the standards as well as the objectives. For the first time, the Police Authority has declared how much of the Force budget will be spent on each objective, based on officer activity and known costs. This process will be developed to ensure the best value for money is being achieved from available resources. The Rural Development Commission is announcing the creation of Action for Market Towns. Action for Market Towns is a membership organisation which will provide advice and support to organisations seeking to revitalise their towns. Market towns are central to our image of rural England. Yet many of them - and particularly their centres - are in decline. This is a matter of widespread concern but the sheer number of such towns in England - nearly 900 with populations under 15,000 -makes concerted and well resourced action difficult. Much depends therefore on initiatives within the towns themselves and so, in consultation with national organisations, local authorities and community-based bodies, we have developed Action for Market Towns to provide advice and a network of mutual support for groups and organisations active on the ground. The services on offer include information about good (and bad) practice, specialist advice, opportunities for sharing experience through a newsletter, visits and an annual convention and lobbying on matters of shared concern at national level. The Commission also plans to make some resources available for research and demonstration projects recommended by members of Action for Market Towns. Readers of this newsletter may recall the recent items about Steam Rollers at Hadleigh. This resulted from a 1922 Garrett 10 ton roller undergoing restoration work at Clacton-on-Sea. This roller was built at the famous Garrett works at Leiston Suffolk for Zachariah Fairclough, a contractor at the Essex seaside town to help build the roads at this still developing town. Mr Fairclough paid £776.00 for the roller which included painting the name 'CLACTON QUEEN' on the motion guard. After many years work at Clacton, this steam roller was sold to Arthur Emeney here in Hadleigh in the 1930s, and was steamed up to make the journey here by road. Once in the town it was used for various contracts until it was sold again, this time to another Hadleigh contractor, Jack Gray in 1953. Sold again in 1964, it was then to he left in a field at Castle Hedingham back in Essex for over thirty years to deteriorate. The roller was then brought back to Clacton-on-Sea, and the 'Clacton Queen' Steam Preservation Society started the long task of restoration to bring life back to this old engine. At the recent Spring Bank holiday weekend, all their efforts were rewarded with the official launch of the 'Clacton Queen'. 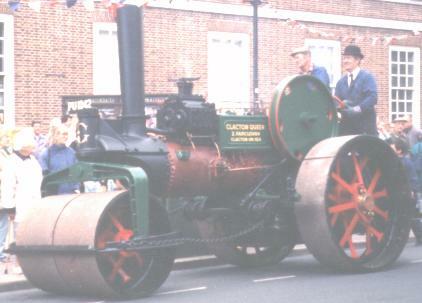 Amid much whistle blowing, the steam roller with gleaming paintwork once again trundled along Clacton's roads watched by an enthusiastic crowd. 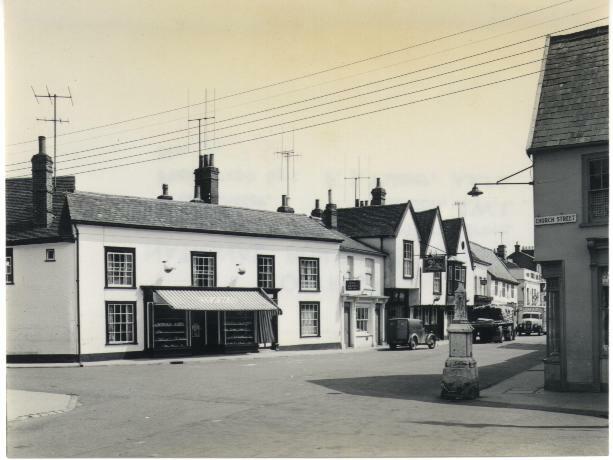 Some Hadleigh residents particularly remember the steam roller being used to break up the surface of the High Street with a scarifier, that implement was second hand when fitted to the new roller in 1922. It is still on the engine today and still capable of carrying out its purpose. The 'Clacton Queen' will be seen at events during the summer to give pleasure to visitors, bring a reminder of days past to an older generation, and be a living example to the young of how things were once powered, and it was built in Suffolk, and once worked in Hadleigh. Has your family lived in the area for more than 100 years? Are you related in any way to the STEED or FROST family? If so perhaps you could help me with my family tree? My Grand parents THOMAS STEED and JANE FROST were born in Aldham and Whatfield in the 1870's and moved to Essex in 1900. What happened to their brothers and sisters? I have just received the May issue of the Hadleigh Society Newsletter, and I can provide a date for the Benton Street photograph reproduced on the front page. The photograph is from a post card, and I have this card , post marked in October 1909, and so well predates the First World War. Apart from the present Raven Way entrance from Benton Street, the view has not changed in nearly ninety years. usually quite current, and it is likely that the photograph was actually taken during that year, or possibly the year before. In later years this criteria cannot be applied with such certainty. After the Second World War, pre war photographs were often still being reproduced for sale, and within the last fifteen years, a series of post cards were on sale in Hadleigh which had actually been photographed before the war, or in the late 1940s. The date cannot be resolved at present. Many thanks for your letter and the enclosed articles by Roger Kennell on steam rollers. Also found the other story, written by Fred Ainger on steam roller trip, very interesting and a refreshing item of our younger days in the time of steam. Yes, I well remember Fred, he was at school in Station Road in the same class as I was. In those days we left school at the very "mature" age of 14 years! My school days ended in December 1938. I well remember arriving in the class one morning to find what we thought was a new boy starting at the school. He was a very fat faced boy who, strange as it seemed, knew us, but we did not know him. It was then we discovered that it was Fred Ainger. His father was a bee keeper and that weekend Fred had an argument with one of the bees! So when Monday morning came round, Fred's face and neck was still very swollen, however he still came to school. A very keen lad, even in those days. I wonder if he can still remember it? In later years, when I was back in Hadleigh and owned the fish and fruit shop, used to see Fred at the garage when I bought my petrol. In May 1959,he sold me a new Morris Oxford All Steel station wagon. It cost me £950. He gave me £50 trade in for my old 1939 Morris Eight car. I took the Morris Oxford out to New Zealand in October 1962, with all our other gear. After many years of use and no breakdowns I sold it in 1984. By then a bit of rust had crept in, but was still in good working order. If you have space in the Hadleigh News, what about an "items from the past" section. Would help to give young people some idea of what life was in Hadleigh years ago. More than 100 councils supported a Bill which would oblige local authorities to set targets for cutting traffic levels or cutting projected growth in the number of car and lorry journeys. The targets would cover the years 2005 and 2010 and would have to be drawn up within 12 months of the Bill becoming law. Actual reduction of traffic would reach the official agenda for the first time. Councils would be expected to attain their local targets by improving facilities for pedestrians and cyclists, boosting public transport, and refusing planning permission for developments which make people more reliant on cars, such as out-of-town shopping centres and leisure complexes). The main justifications for the Bill include the need to cut the growing levels of noise and pollution from traffic, to curb the demand for new roads, and to make towns and cities more attractive. The Society have been invited to participate in the above event, joining in the celebration and helping to make the day a great success and putting Hadleigh on the map. We have booked a stall and have other schemes in hand to promote our cause and enlist new members. What we need now are a few volunteers lend a hand a man the show br an hour or two. The fair will be in the High Street between Angel Street junction and the Market Place (and within the Guildhall complex?) between 12 noon and 4.00 p.m. on the above date. The Secretary would be pleased to hear from you at 16 Highlands Road Hadleigh or by telephoning 823991. The next Society meeting will be upstairs in Hadleigh Old Town Hall when Richard Ward will present his 'OLD HADLEIGH PICTURE SHOW' from 8 p. m.
This is a change of role for Richard who is, of course, the District Council's Conservation Officer and very active in the town on conservation business. Do try and join us if you can - its bound to be a popular evening. As in previous years the Hadleigh Society took the opportunity to show its activities to the community at large, featuring a display of tools loaned by Roger Kennell. We were pleased to meet members and prospective members. If you can spare some time to help on the stand next year it's a good opportunity to meet people. The Hadleigh Society Internet Web site continues to be updated with new material. Recently this stimulated an enquiry from Israel regarding the Hadleigh coat of arms. Anyone interested in joining the Files Group and putting the Society on the international map should contact Graham Panton (823503) who will be calling a meeting in the near future. Several members have expressed an interest in re-forming an Environment Group, meeting about every 2 months. For several years the Environment Group ran alongside the History Group and encompassed the Planning Panel. The latter has continued to perform its vital role but does not provide the opportunity to study the broader aspects of the future of the town, such as traffic problems. If you have an interest then please come to a meeting at 94 Benton Street on Wed 13 Aug, 8pm, call Hattie Bawden (823193), or any other member of the Executive Committee.